Sound artist and lecturer, Dr. Yong Su Clark is a staunch advocate for new music and music education. He received his D.M.A. from the University of Maryland College Park, his M.M. from the Yale School of Music, and his B.M. from Temple University. 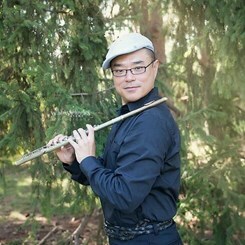 Yong is the former Principal Flutist of the 257thArmy National Guard Band of Washington DC, former Principal Flute of the Baltimore Sinfonietta, was the Acting Principal Flute of the Harrisburg Symphony Orchestra, and is a core member of Ensemble Next Parallel of Washington DC. As lecturer, he has given talks and masterclasses at the University of Maryland, James Madison University, Penn State University, and Wellesley College. As a performer, Dr. Clark has performed in prestigious houses such as the Terrace Theater in the Kennedy Center, the Weill Recital Hall at Carnegie Hall, the BANFF Centre for the Arts and Creativity, and numerous houses in Graz, Austria. He has performed in The National Gallery of Art, the Philadelphia Art Museum, and the Museum of Fine Arts in Boston. Request Lessons with Dr. Yong Clark today!